William Farber's kite making book, Painting With Light and Air is now available from the Drachen Foundation. My wife got a copy for me last year but she had to deal with international money orders and shipping from Australia. She did get the first copy in North America but it cost a bit. Now it is a simple click and you can get it for $35. 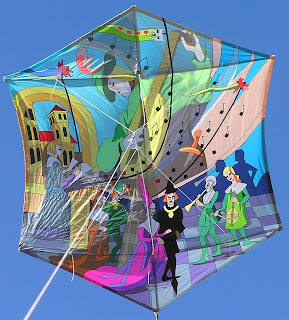 In the book, William Farber illustrates his method of creating wonderful pictures on kites using ripstop. His prize winning kites are many colored pieces of flying artwork. The kite on the right is one of two he made for the kite festival in Dieppe France in 2008. He gives step by illustrated step instructions for his modular method of kite construction, very much worth learning if you want to make more complex designs on kites. They don't have to be as elaborate as this one to benefit from his method. The book is available from the Drachen Foundation for $35. The Drachen Foundation is a non profit organization devoted to sharing knowledge of kites worldwide. Their store includes books and kite making materials and the money helps support the organization. My name is Calvin Shelton and I am on the Board of Directors for the Bridgton Historical Society. I am writing in hopes that you may be able to help or at least point me in the right direction. Part of our mission at the Bridgton Historical Society is to carry-on and teach traditions of the past to the next generation and keep the past alive. This year we would like to present to the public a view into the past concerning kites and kite flying. 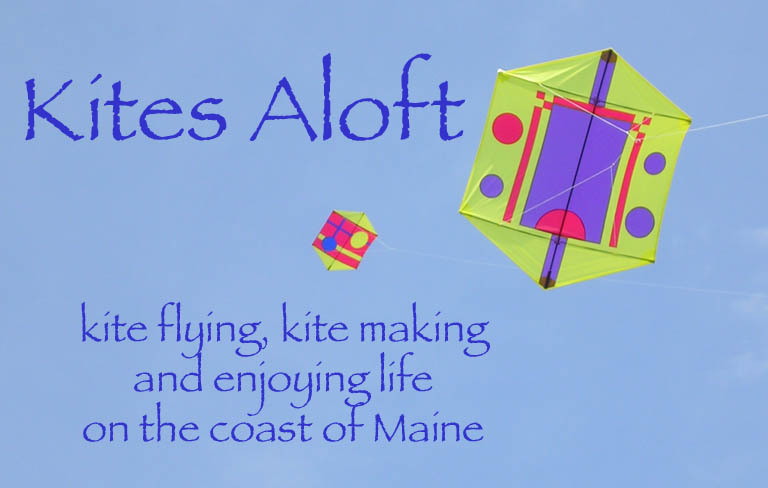 We are looking for individuals interested in perhaps sharing the history of kites, kite making and kite flying at a weekend outing at the historic "Narramissic," The Peabody-Fitch farm here in Bridgton scheduled for Saturday, August 14th, 1pm to 4pm. The Historic Peabody-Fitch Farm has several large open fields ideal for kite flying and demonstrations. A large barn with ample indoor's area which is available that may be used for work areas and booths where interested party's might demonstrate the history and art of kite building and repair as well as sell kites and materials related to the day's activities. We are currently in the planning stages and would appreciate any input and recommendations you or others might have. Please feel free to pass this along to anyone you might feel would be interested. Thank you for you valuable time and I look forward to hearing from you and others about this fun topic.